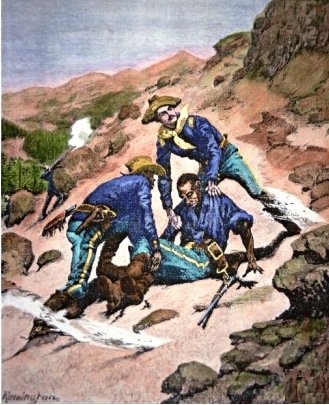 Frederic Remington, Illustration, that appeared in Harper's Weekly, 21 Aug 1886 depicting rescue of Corporal Edward Scott by Lieutenant Powhatan Clarke. This colourised version is in the author's collection. Corporal Edward Scott was a Frontier Cavalryman who served in both the 9th and 10th U.S. Cavalry. He initially enlisted in the 9th on the 12 December 1878 and after training he was assigned to D Company at Fort Lewis, Colorado. His first action would take place at a crossing on the Milk River where the White River Utes had attacked and laid siege to a column from Wyoming commanded by Major Thornburgh, who was killed. Scott's D Company, commanded by Captain Dodge set out to relieve the force but would in turn come under attack when his command had reached the original column. Other fights would follow. Having served 5 years in the 9th he left the army only to re-enlist on 21 December 1883 in the 10th U.S. Cavalry and assigned to K Company. Less than 12 months later he would be promoted to Corporal. In 1886 a raid by Apaches from across to border in Mexico saw Scott's company in the field and in hot pursuit of the raiders who returned to Mexico. Captain Lebo, who commanded D Company, crossed the border into Sonora and would encounter his quarry in the Sierra Pinito where Geronimo had set up an ambush position, which Lebo had recognised would be an ideal location and in the fight that followed, Edward Scott would be wounded. It was on receiving this wound that he called for help from his comrades and Lieutenant Clarke responded and dashed forward to where Scott lay. As he was unable to lift Scott on his own he called for a trooper to assist and between them they dragged the Corporal to cover. Clarke would receive the Medal of Honor for his action. Scott would go to Fort Huachuca to be treated but he had to have his leg amputated in the field. Despite his critical condition he survived. It was whilst Scott was in hospital recovering that Frederic Remington interviewed him and also Lt Clarke. From this he recreated the rescue for the cover of Harper's Weekly. Scott would be medically discharged and went to live in Washington D.C., it was here he met his wife. They had two children. Edward Scott died in 1919 at the age of 62. His wife Sarah would die in 1947. As the author remarks in his Afterword, Edward Scott's career was not spectacular nor did he receive any awards for gallantry but his story is more broadly representative of the ordinary African-Americans who served in the U.S. Army during this period of history.